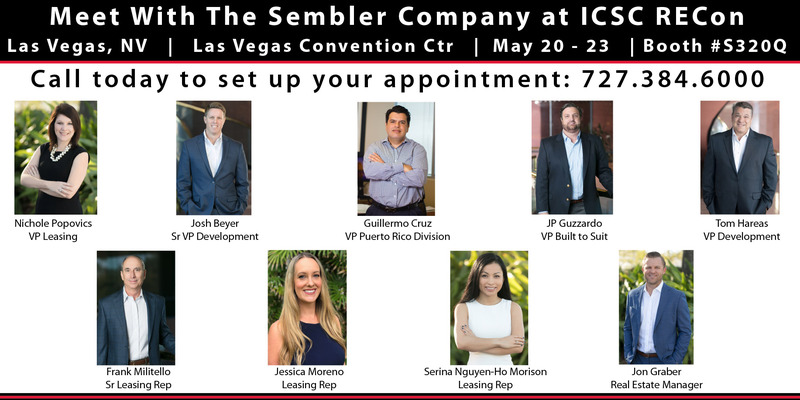 The Sembler Company will highlight its latest developments and opportunities at this year’s ICSC RECON, May 20-23. Meet the Sembler team at Booth S320Q. Sembler remains committed to building, buying and improving shopping centers to better serve the surrounding communities, while providing associates with every opportunity to contribute to these same communities through numerous philanthropic activities. Sembler currently has approximately 530,000 square feet in ground-up development or re-development across the Southeast, with strong growth in the grocery-anchored sector. The company is also actively working on complementary retail projects in its new venture with Atlanta-based Berkley Development. Sembler’s Build-To-Suit division continues building out stores across the Southeast and Puerto Rico for users in a variety of categories. Particularly, Sembler is actively doing deals with tenants such as Advance Auto Parts, O’Reilly’s Auto Parts, Take 5 Oil Change, Express Oil, Chick-Fil-A, McDonald’s, Wendy’s, Wawa, Circle K, Walgreens, Verizon, and Skechers. While big-box closures are big news throughout the industry, occupancy over Sembler’s entire managed portfolio averages approximately 95%, including Sembler-owned and third party properties throughout the Southeastern U.S. and Puerto Rico. Sembler signed more than 52,000 SF in new leases, as well as more than 50,000 SF in renewals, in Q1 2018. And of course, Popovics says, “The grocery sector isn’t going anywhere. Even with expanded delivery, sales are steady – they still need bricks and mortar.” Well-located, grocery-anchored centers are thriving and seeing high demand for available in-line space. Sembler, both directly and through its venture with Forge Capital Partners in their Forge Real Estate Partners (FREP) investment funds, continues seeking to acquire shopping centers throughout the southeastern U.S. In the past year, FREP has acquired three shopping centers: Seneca Square in Charlotte, NC; Humblewood Center in Houston, TX; and Gainesville Shopping Center in Gainesville, FL. To date, FREP has invested in eleven shopping centers in Florida, North Carolina and Texas, representing about 1.5 million square feet of leasable area. “We are particularly proud of our efforts to invest in and adjacent to low- to moderate- income areas where we can take older, tired centers and greatly improve them to better serve these areas and provide a more attractive, cleaner and safer environment to shop in,” says CEO Wheeler. Sembler launched a new website this month, to streamline navigation and make it as easy as possible for users to find what they need. “In talking to people who visit our website – from land sellers to potential tenants to development partners – we found they’re looking for convenience,” said Sembler CEO Ron Wheeler. “They want only the most relevant information on the website, available with as few clicks as possible. And, we found they were just as interested in who we are, as what we do. Our new site provides a better picture of that.” To see the new site, visit www.sembler.com.